A little about me, I retired from the U.S. Army, after 21 years of service. I graduated from Fayetteville Technical College, with degrees in Funeral Service and an Associate in General Education. I have 12 years experience in the security field. I also worked at Cape Fear Valley Hospital as a Security Supervisor for 6 years. I came to work at Carolina Trace Security in October 2003, at which time I assumed the duties as sergeant, in March of 2004 I was promoted to Chief of Security. My staff consists of 3 full time Security officers and 6 part time officers. My duties include, access control, incident response, vehicle permits, patrols and other duties as required. Once inside the guarded gate you become aware of something special - the peacefulness and seclusion of a private, residential community of homes and activities designed for all ages. Here you can safely ride a bicycle or take a walk through nature. Half of the acreage, which is fertile in dogwood, holly, oak, and southern pine, has been preserved in its natural state. At the hub is private Lake Trace, with seven miles of shoreline, where you can enjoy excellent fishing or boating. Swim in the lake, in an olympic-sized pool, or in one of over a dozen community pools. You're in the heart of North Carolina golf country with the mild climate which is so characteristic of the Sandhills... so play golf year-round. Carolina Trace has 36 challenging holes of championship golf designed by world-renowned golf course architect Robert Trent Jones. These two member-owned courses are secluded and wind around sparkling Lake Trace, through the rolling hills, and between the homes. Since its development in 1969, this private and affordable community continues to grow and improve. 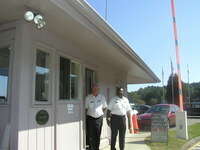 Carolina Trace maintains a guarded gate, 24-hour security patrol, and its own fire department. There are homes in a variety of beautiful styles and in every price range. Being diversified, we offer resale homes, new "spec" homes,and rentals. If you can't find what you desire, we will custom design and build your dream home.